A school council is a group of students who are elected to represent the views of all pupils and to improve their school. This year's school council has got off to an exciting start with several representatives making great suggestions and having lunch together round the big table is certainly a hit too! Each class has a pupil on the council or is represented by a pupil who will visit their class and collect their views and bring them back to the meetings. The school council is an exciting thing to be part of for pupils and staff as it's about the children be involved in contributing to and making decisions about things in the school and the school community that impact them. It is especially important for our pupils to have the chance to communicate their views and opinions and not be overlooked. All School Council have badges bought by Mrs Lloyd and proudly wear them to promote their role in school. "Thank you very much Mrs Lloyd". School Council are excited to be taking part in The Big Battery Hunt. They have ordered their recycling battery bin and look forward to bringing you more news very soon. 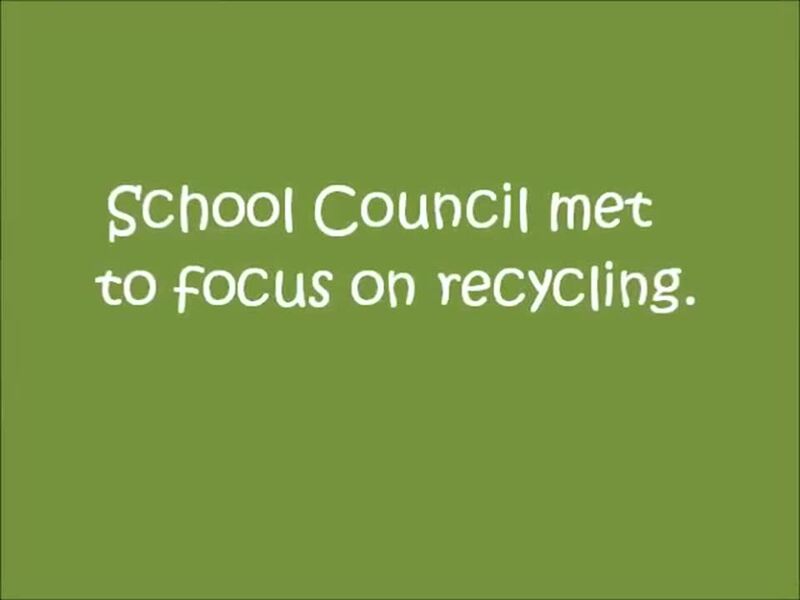 School Council met and decided in their working groups that this term they would like to focus on recycling and playground equipment. They organised a vote to decide what they were going to do. School Council met with Bob our School Caretaker for a question and answer session. They took turns to ask Bob a variety of questions about how and what we currently recycle in school. Bob gave them plenty of useful information and then showed us the bin areaexplaining how waste is sorted and stored in school. Some people were dressed as book characters for World Book Day which made it even more memorable. School Council decided to raise money to buy play equipment for Red and Blue zones by creating a calendar. Every child in school contributed and they looked really nice. They sold them for £2 each and raised over £400! Thank you to everyone who supported us.